Adobe isn't making any announcements about the next version of Creative Suite at its MAX conference but it is showing 'sneak peeks' of future features for Photoshop – including realistic painting that simulates real brushes and paint, and tools for invisibly removing stray wires, road signs and other eyesores. 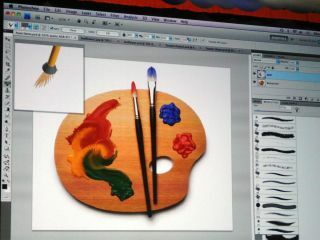 Using a 3D Wacom Intuos pen and tablet, Senior Vice President of the Creative Solutions business John Loiacono demonstrated not just the kind of simulated natural paintbrush you get in Corel Painter, but a 3D paintbrush that you can rotate to get a different angle on the brush head. As you turn or twist the 3D pen, you see a live preview of the brush – and of the pattern of bristles on the brush head that you'll get on the canvas. Using the 3D brush, he mixed oil paints on an artist's palette and showed the colours mingling and spreading realistically, like real paint would. "What we've done," says Loiacono, "is analyse the properties of the liquids that this represents and modelled how they merge as chemicals and when they dry, what the drying pattern would be." He also showed off paint effects for turning a photograph into a painting much more effectively than the current artistic effects filters in Photoshop, creating what he called "photorealistic" effects in a few minutes. The touch-up tools come from Adobe's Creative Technology lab, so they might be quite some way away from making it into Photoshop. Researcher Dan Goldman called the technique "intelligent hole filling"; instead of just copying the surrounding area to replace what you're erasing, he said the tool "looks for patches outside the hole that match and stitches them together so they fit, stitching together multiple regions for a better match". It looks similar to the Smart Erase tool in Microsoft's Digital Image Pro but Adobe claims that randomly sampling patches across the image makes its 'PatchMatch' technique 20 to a 100 times faster than previous algorithms. Goldman demonstrated the technique with the Spot Healing brush and the Content Fill tool. He cut out trees and a power station from the skyline and erased power lines running in front of a building. In some cases it was hard to tell that anything had been removed, though in others the tools sometimes introduced extraneous background detail. Goldman did emphasise that nothing shown is guaranteed to be in the next version of Photoshop but it's a good indication of the latest image editing research that Adobe is involved in.